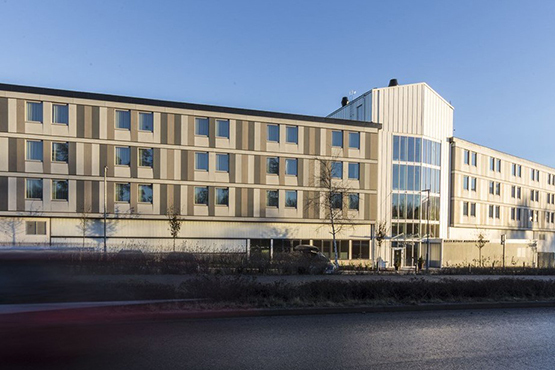 When Forta Modular designed the First Hotel Arlanda Airport, which opened last year in Stockholm the company used "prefabricated modular technology" to cut down on time and cost. The company was involved in the process of design, fabrication and delivery of the modules for the hotel. The guest room modules—complete with interior furnishing, bathroom, furniture and infrastructure—were manufactured at the Forta Modular factory and delivered to the site as a 3D volumetric, prefabricated module. The foundations, module assembly and façade decoration were completed onsite. "Forta Modular construction technology offers savings of financial resources and time for hotel developers," the company said in a statement. "This flexible solution is environmentally friendly, as it considerably reduces the amount of construction waste." A key advantage of modular design is speed, the company claimed. Since the rooms could be created in a factory while the foundation was being built, the property opened much faster than if one step had followed another. The rapid opening also provided the owners with a faster return on investment. While prefabricated, modular hotels have been popular in Europe and Asia for a while, the concept is now gaining ground in the U.S. The majority of the new 210-room CitizenM hotel in Manhattan’s Lower East Side is being constructed off site, in Chojnice, Poland, and will be transported by ship to New York. Upon arrival, it will be pieced together like a Lego set in modular blocks, with all furniture, fixtures and equipment already in place. Across the East River, a new Pod hotel is going up in Brooklyn. Pod is the product of BD Hotels, which is owned by hoteliers Richard Born and Ira Drukier, and rooms for the company’s newest hotel in the Williamsburg neighborhood are coming from Gdansk, Poland.